These WHEEL CHOCKS are specially designed for mine haul trucks with tire sizes up to 105" diameter and load capacity up to 120 tons. 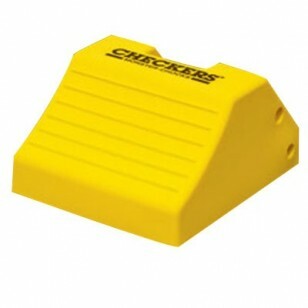 Monster's WHEEL CHOCKS are made from tough, damage resistant polyurethane. They will not cause tire damage and are oil, fuel and solvent resistant. They are strong, safe and lightweight, yet they hold the largest haul trucks. A great feature includes a "How to Use" guideline molded directly into each chock for additional safety and convenience. OSHA SPECFIES 1910.178 (k) Trucks and railroad cars. (1) the brakes of highway trucks shall be set and wheel chocks placed under the rear wheels to prevent the trucks from rolling while they are boarded with powered industrial trucks.